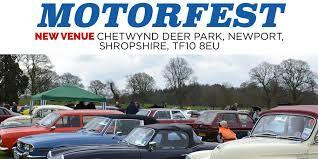 There will be a Joint Shropshire & Stoke Group Stand at Motorfest. Up to 1,000 classics expected for the two day motor extravaganza, live arena parades and great Easter family fun! Live music featuring classic sounds from the 1950's to 1980's. The number one Easter weekend motor event in the Midlands celebrates its 32nd anniversary at this fabulous new venue, a fun packed event for the whole family. Classic motors from the 1930's to the 1990's on display including over 30 local car clubs plus trader and autojumble stalls, this is the must attend event in the Midlands this Easter. With an interactive arena timetable throughout the day featuring arena parades, 'Pride of Ownership' awards plus our famous 'Decibel Duel' where we look to find the loudest vehicle at Chetwynd Deer Park. Tickets £4 each from Stuart Heaton (Deadline has passed). Chetwynd Deer Park, Newport, Shropshire, TF10 8EU.